It wasn’t raining exactly, more like a fine mist. In the mid-forties made the air feel chilling and raw. We only went to the end of the road this morning. Even Gus was ready to go home and stick has head back under the bed. I really hope the sun comes out soon. I miss those warm sunny days we had. This weather puts me in such a bad mood. Cora was disappointed that her picture was not in yesterday, so here she is. 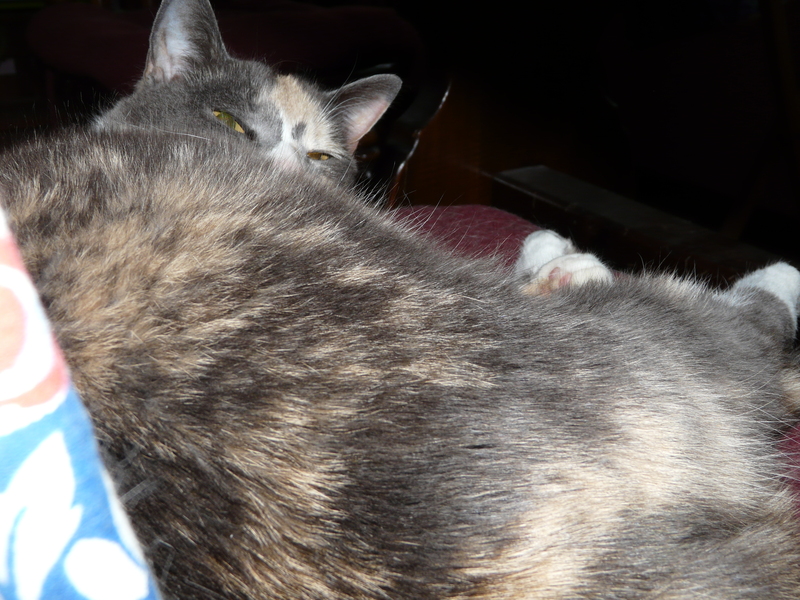 It’s not a good picture, but she was mad at me at the time. 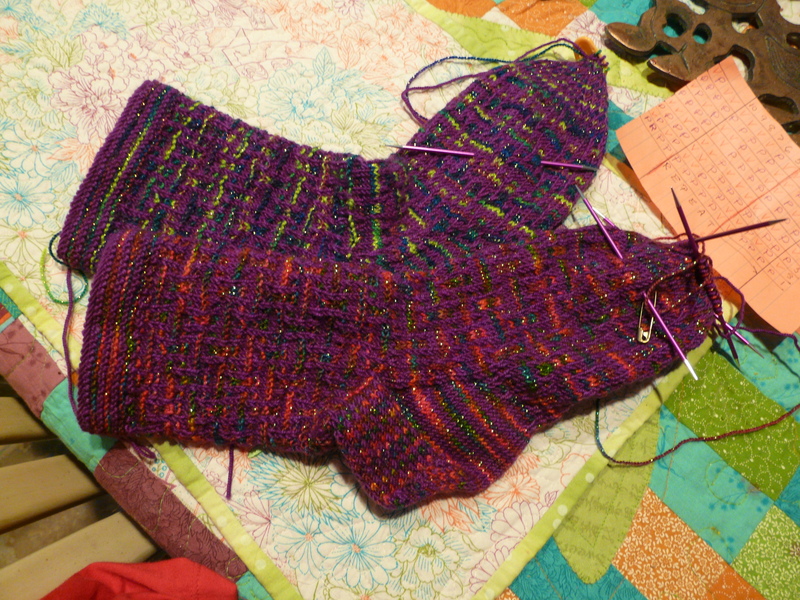 My socks will be finished today, except for the toes. I want my daughter to try them on first. They should fit. Her feet are only a half-size bigger than mine. I can’t decide what to start on next. There’s the vest, but another sock club arrived and I don’t like getting behind on them. Maybe after I get all the yarn rolled, I’ll know. Yesterday, I forgot what day it was. I needed a pedicure and I wanted a manicure so I called. I thought it odd when I was told to come at a specific time. Usually, I get, “When do you think you’ll be here?’ When I walked in I was surprised at how busy it was. The greeter said, “Well, it’s always like this on Friday and Saturday.” I couldn’t believe it. I never go around the weekend for this reason. I even pulled out my phone to check the day. Yep. It was Friday. Just shoot me and bury me in the back yard. Boy. Wouldn’t that surprise the next owners. I thought it was time for a plain pair of socks. As you can see, I didn’t make it. I didn’t even start out with a plain rib. And whereas the yarn is subdued, it isn’t plain either. This is Sockotta yarn which is nice for Summer. The leg is purposely loose. 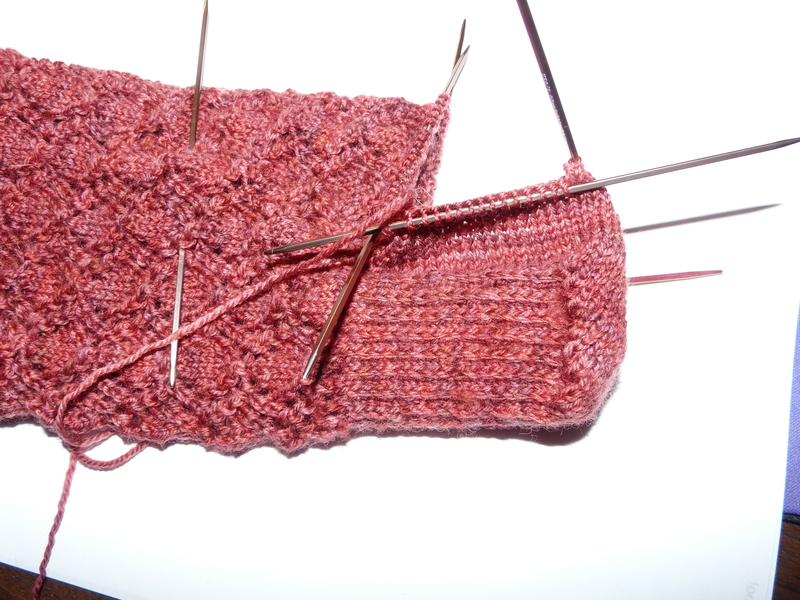 I used a smaller needle for the heel gusset and decreased an additional six stitches on the foot. It fits just the way I want it. All right. Get your minds out of the gutter. 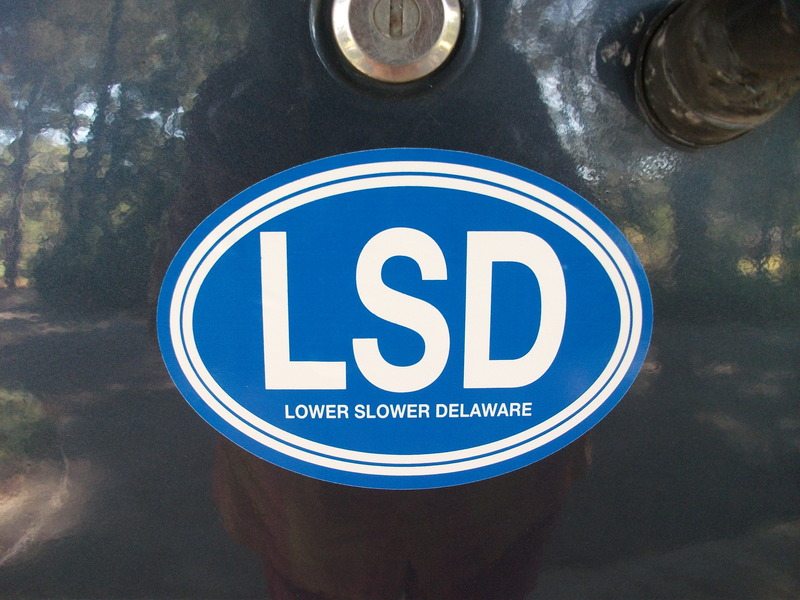 Around here, LSD means Lower Slower Delaware. Things are different here. That upper part might as well be part of Philadelphia. I would also like to thank my Grandson for giving me this sticker. He knows what Nanny likes. I display it proudly. I’ve finished the socks and have started on mittens to match. 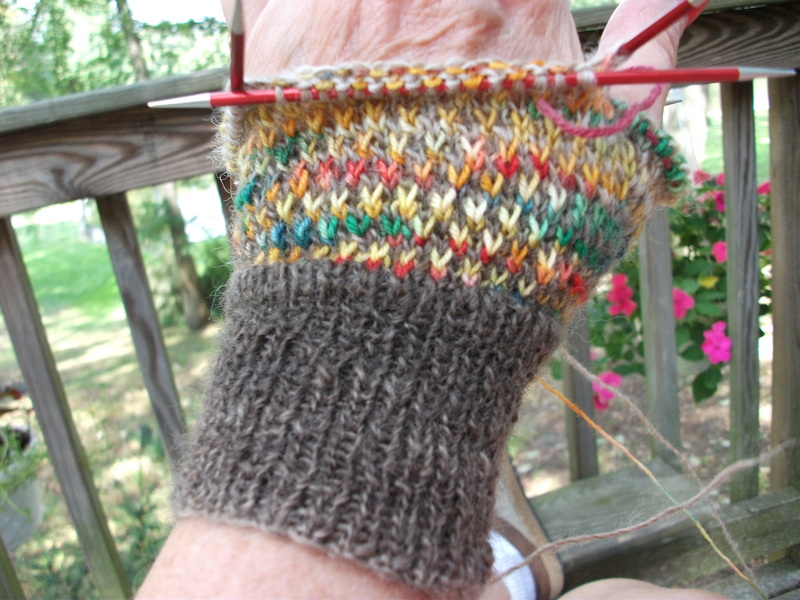 With the pattern,doing the thumb gusset was a little hairy, but it turned out well. 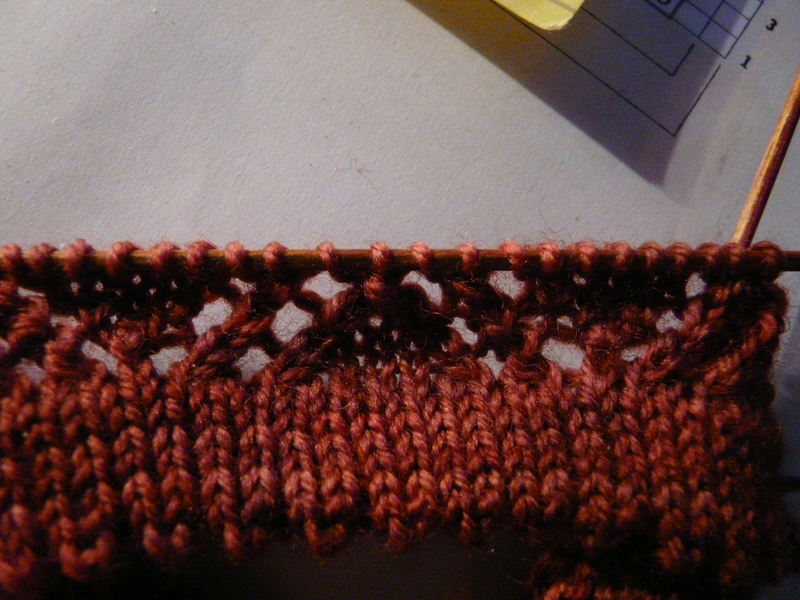 I decided to start the cuff with the tan/brown this time. I think I mentioned that it is lighter than the yellow/orange/green. Socks get more tugging and pulling than mittens so it should be all right. Did I mention that I will be delivering these in person? I finally bit the bullet and booked a flight to Bismarck, ND. This will be my first time since 9/11. So many rules! It’s kind of scary! I hope I live through it> At least I’ll have my knitting. I was thinking about washing my socks, but I think I may still have an occasion to wear them. So I washed my gloves instead. One pair needs mending so I need to find the obligatory scarf. It’s pretty small. I’ll barely be able to get it around my neck afterwards. After I finished washing, I found another pair and I think there is a pair in my heavy coat pocket. Oh, well. Maybe they will get their chance next year. 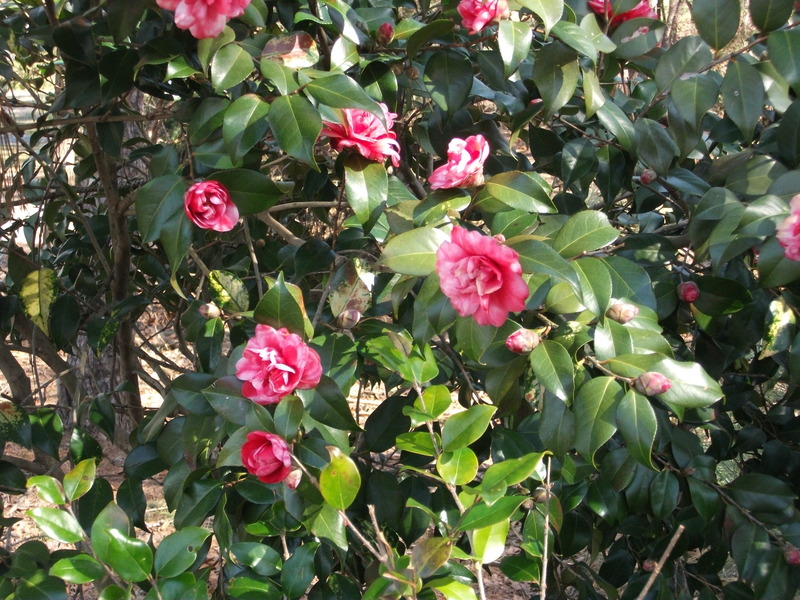 We rode down to Jeff’s Nursery this afternoon and found the bushes that Doug wanted. He bought four in two different colors. You never know about that man. I decided that I need yellow socks, especially for summer. I couldn’t find anything in my stash that was appropriate. I found some on-line in Sockotta. Now I don’t know what to do. I can’t buy just one ball of yarn. If I spend $100 I get free shipping. I can’t stand it. I just can’t stand it. OH! And they were cheap, too! I can’t stand it. I paid my bills and ordered the rest of my Christmas presents. There were no phone calls, no stamps and no driving. Don’t you just love technology? Just check out the socks! Speaking of socks, only five inches left on my red socks. I’ve been ‘kinda’ busy today. I tried to put a handle on the clutter, but it didn’t work out very well. So, I took a shower and washed my hair. Everything looked fine after that. We went food shopping. They had green bananas and naval oranges. Life is good. 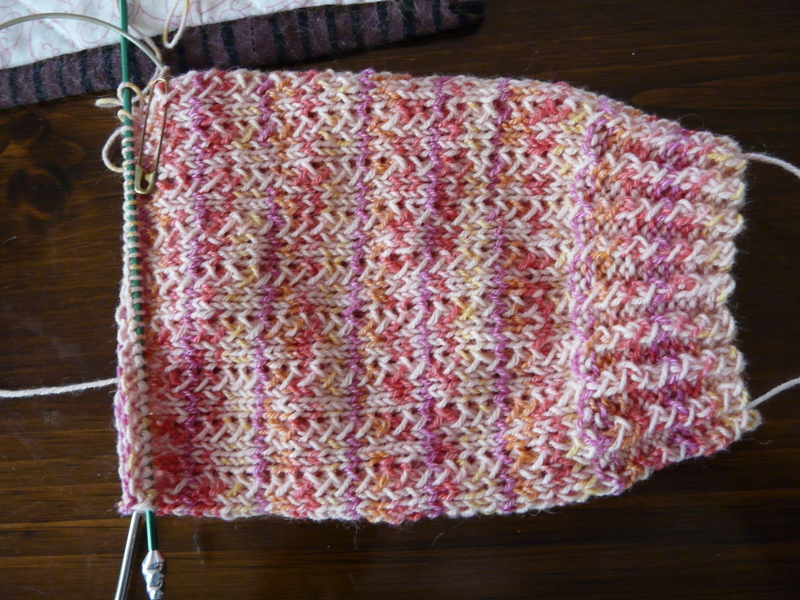 I finished the heel on my second red sock and started the decreases. When I picked up along the sides, I had 21 stitches on one side and 19 on the other so I had play with it a little. 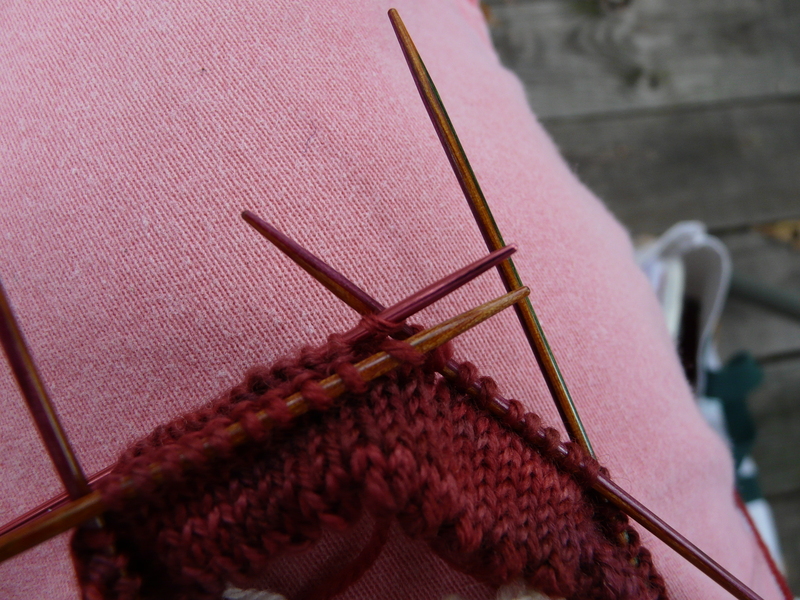 See the square needles. They feel odd at first, but they work very well, especially on k2tog. 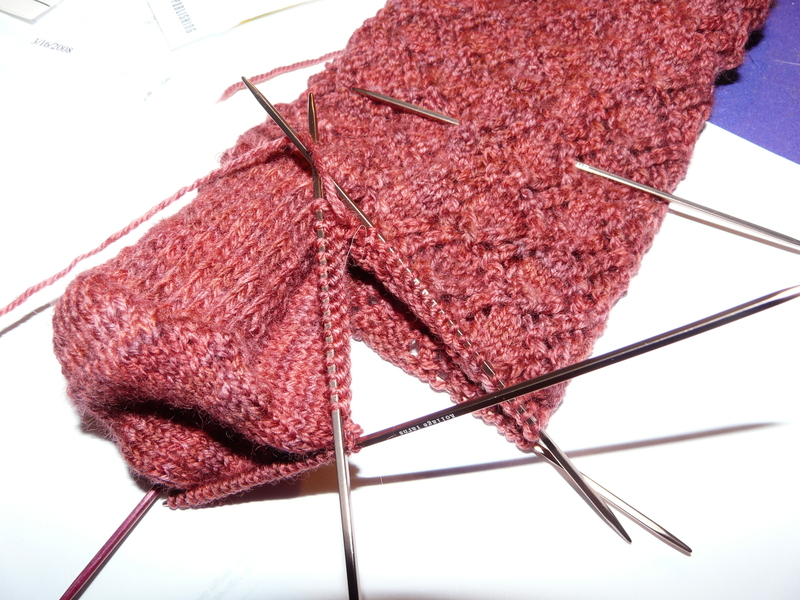 I made the first sock using round needles and there is no difference in size. I just wish there were six instead of the usual five needles. 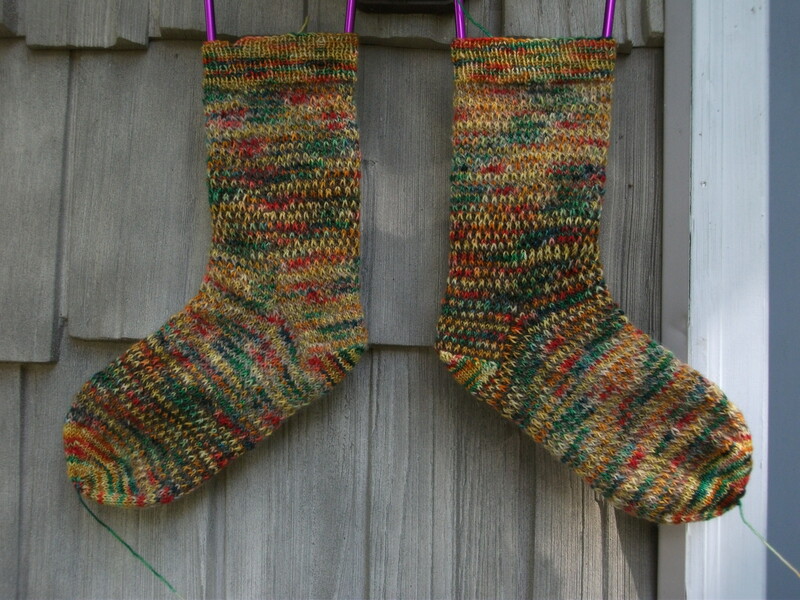 I like to have six when I make socks and sometimes seven. Posted in Family and Friends, Knitting | Comments Off on Wednesday Already? And, now, we are getting a lot of wind. We were able to get out for a short walk this morning. I spent most of the day getting ready for Stitches. And Doug washed my purple jeans for me. I have some clothes there, but I wanted to take some of my nice sweaters and socks if it’s cold enough. I also made sure I had everything I needed for class and , of course, personal knitting. I’ll be taking the subway everyday so maybe I will get the other sock finished. I hope to leave fairly early tomorrow. I think I will drive to Reisterstown and unload the van first, then drive to the subway station and ride downtown. I’ll pick up my badge and go to the market before returning. I don’t think leaving my van in a downtown parking lot with all that stuff including a $300 camera and $1000 sewing machine was a good idea. I wouldn’t want anything to happen to my sweaters either. This is as far as I have gotten so far. I worked on my Einstein this evening. I believe I’ve finished the embellishing. It looks pretty good. I took off the collar and started another. If I like this one, I may put on cuffs. 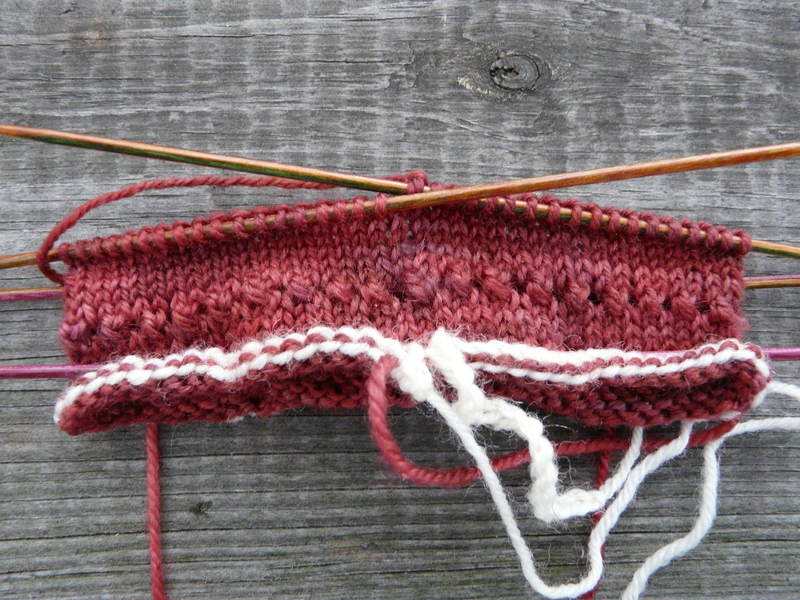 After I finished the gloves, I did all my homework for my Stitches classes and started another pair of socks. I am using the club yarn I got last month, but I am not using the pattern. I found something I liked better. It’s from More Big Girl Knits. 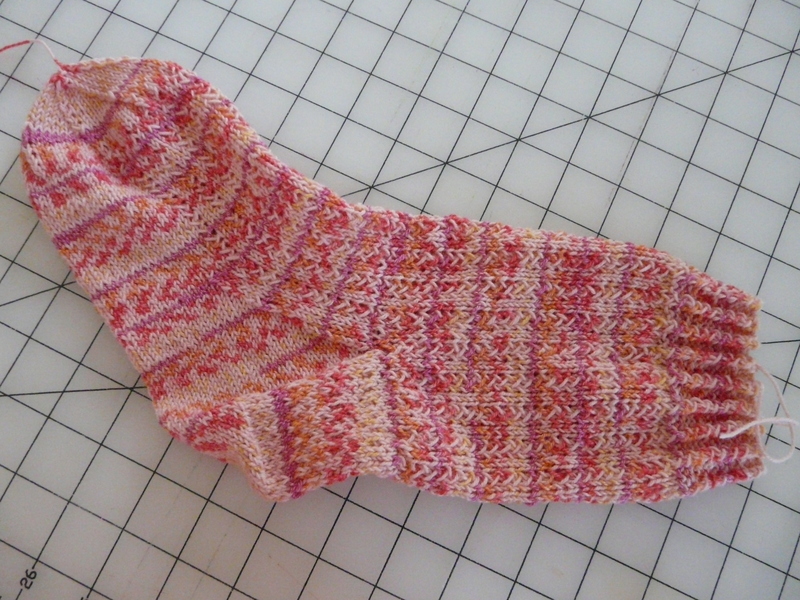 There were two sock patterns in the book and I like them both. I like the lace pattern and the hemmed cuff. Look at this tidy cuff. I love it. I was surprised at how much I accomplished in what seemed to be a short amount of time. I am so glad to be through with the gloves. I felt like I had been working on them forever. Usually a pair of gloves takes a couple of weeks, not months. The pattern said to make a crochet cast on from waste yarn. I’ll probably do a provisional cast on with the other sock. The result will be the same and you don’t see it anyway. 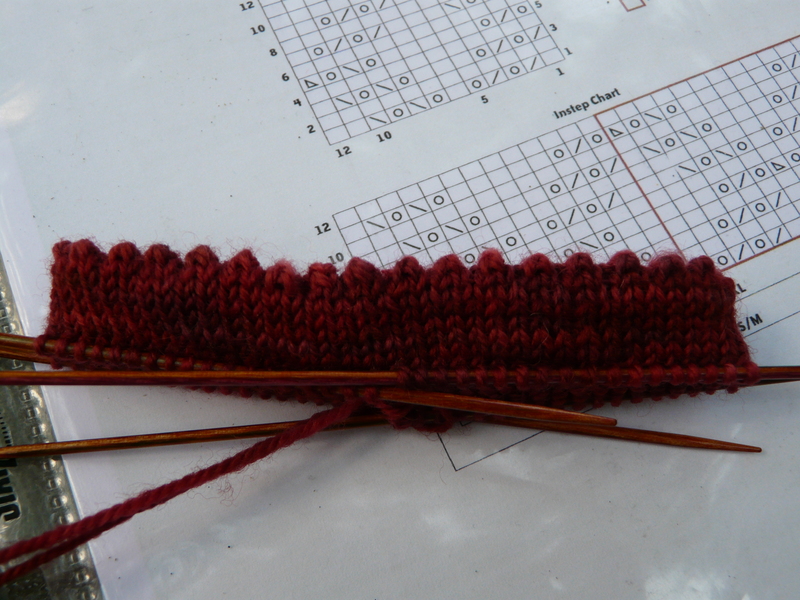 It’s just that I am left handed, but I knit right handed, sort of. I can give myself a headache trying to think backward. Here, I have done the hem and am ready to pick up the edge. The pattern said to unravel a few stitches at a time, but I did eighteen at a time. It was quicker. 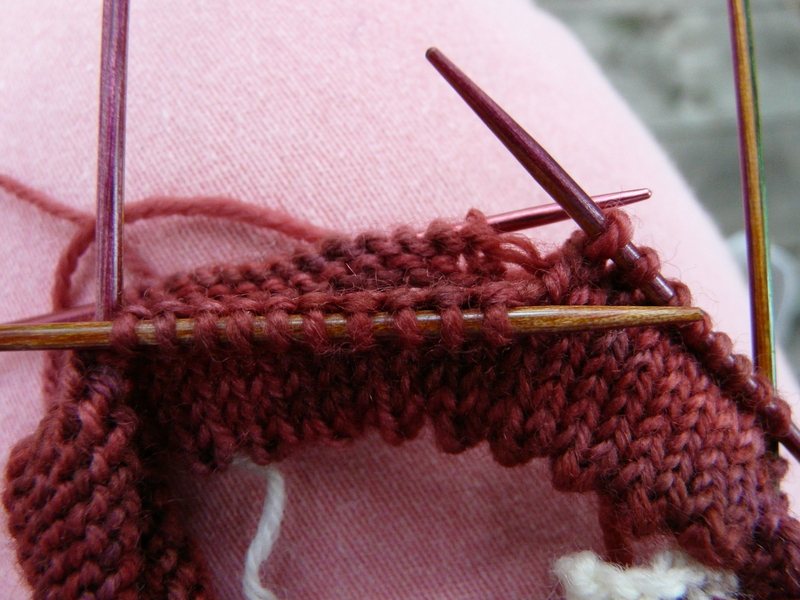 Put the unravelled stitches on a size smaller needle. 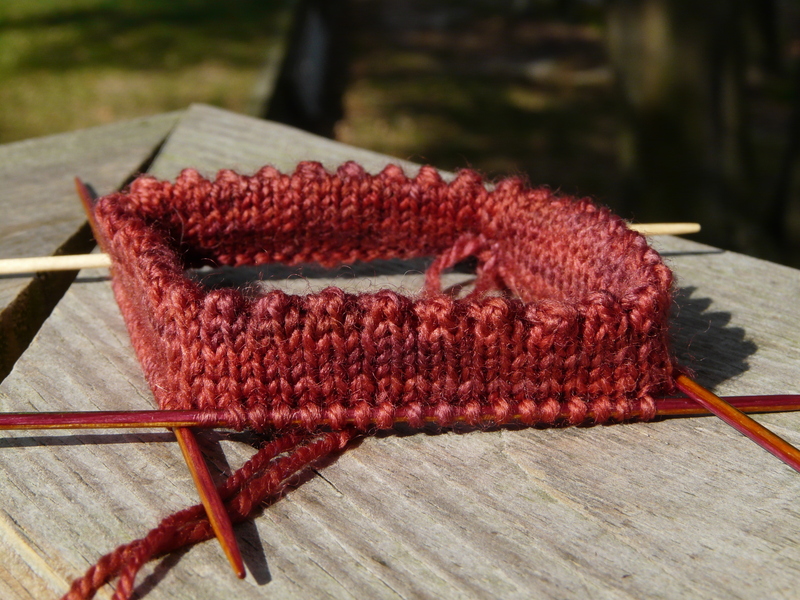 Bring them up and knit through the stitch on both needles. It’s a little awkward at first, but it soon goes quickly. Keep the stitches tight and even. It’s a great look and well worth the effort. This cuff also looks good on sleeves. I really think I am going to like these socks. The temperature drops below eighty and my feet get cold. I could have put on a pair of my wool socks, but I was being lazy and I went with closed toe shoes. I don’t think it went much above seventy today. I had to put on a long sleeved shirt when we went to the supermarket. I’m still running around in shorts though. I really shouldn’t. I have arthritis in both knees. I worked on my quilt for a little while today. I’m about three quarters of the way through part two. 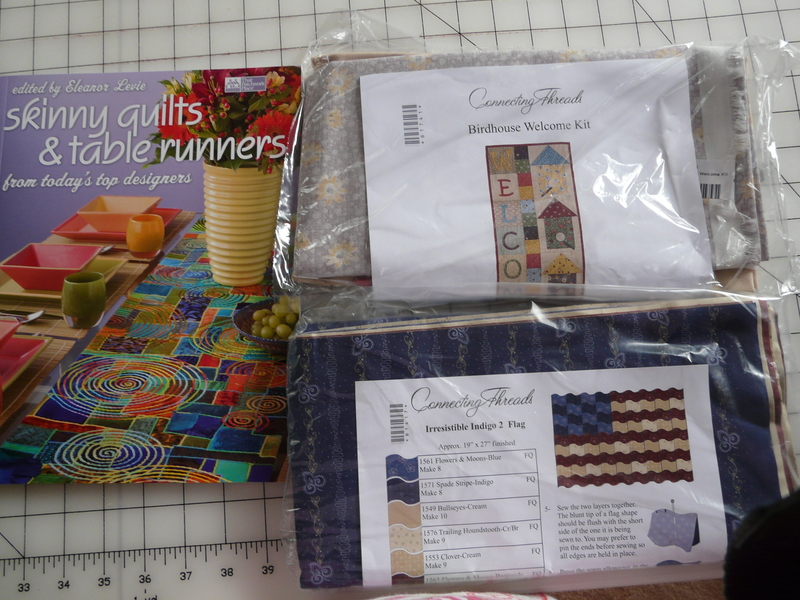 I got some quilt stuff in the mail today. The book looked interesting and I have two little projects to work on when it’s too cold to go out and play. 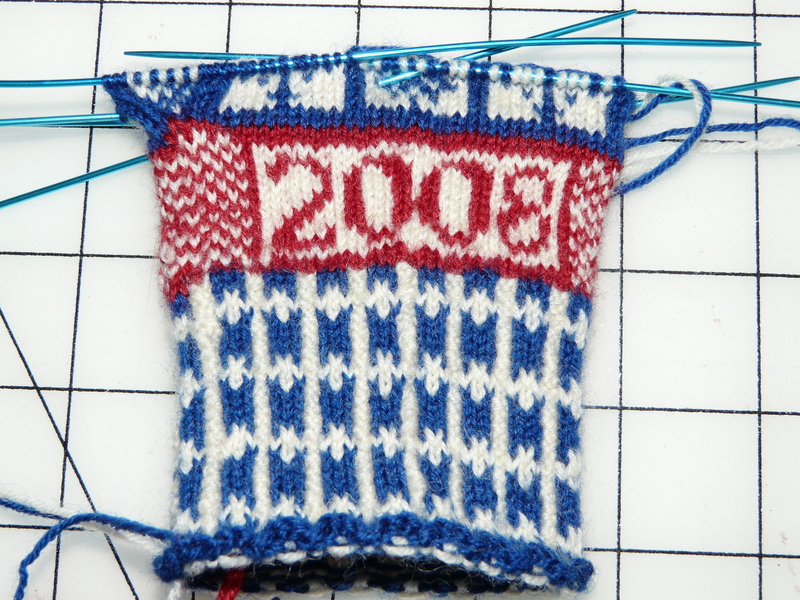 I started the dreaded thumb gusset on my gloves.